In the wake of the devastating floods that have caused much on central Thailand to shut down, and also inundate the old capital Ayutthaya, some experts suggest revitalising the ancient canals to help run off water in times of flood. Water fowl, monitor lizards and stray dogs have replaced the throngs of tourists at one of Thailand’s greatest historical sites. Record flooding has turned Ayutthaya’s ancient temples into islands, and a giant statue of the reclining Buddha appears to float miraculously on the lapping water. Experts fear that at least half of the more than 200 waterlogged monasteries, fortresses and other monuments in the one-time royal capital have been damaged. “Imagine a thousand tons of brick and stone resting on soft foundations, with no modern-style pilings. 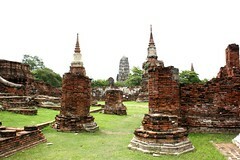 We are very worried,” said Chaiyanand Busayarat, director of the Ayutthaya Historic Park. And as flood waters recede, some experts are proposing a radical change to prevent similar disasters in the future: Turn back the clock about four centuries to emulate the city’s urban planners and engineers of that time. “We can’t prevent flooding so we have to learn to live with water again, like those who created Ayutthaya. Let’s take out the old city maps,” said Anek Sihamat, deputy director-general of the Thai government’s Fine Arts Department.